The carriage bolt derives its name from its use as a fastener in horse-drawn carriages. The square portion beneath the rounded head of the bolt makes it ideal for for wood penetration. When the bolt tightens into a piece of wood, the square portion keeps it from spinning. These bolts work best for hardwood applications, because the head would simply strip through softwoods. Understanding the design and fastening method better serves a person trying to remove a carriage bolt. Carriage bolts are often countersunk below the surface for safety and aesthetics. Equip a socket wrench with the appropriate sized socket. If you're not sure of the socket size, install and remove sockets over the nut of the carriage bolt until you find one that fits tight. Push on the head of the carriage bolt with your thumb and twist the nut counterclockwise with the socket wrench. The pressure from your thumb will keep the bolt from coming out of the hole while the nut's being loosened. If you allow the bolt head to come out of the hole before the nut is removed, the bolt will spin in the hole. This will make it difficult to remove. Remove the nut completely from the threads of the bolt. If there's a washer, pull that off too. Strike the threaded end of the carriage bolt with a hammer to push the bolt head out of the hole. 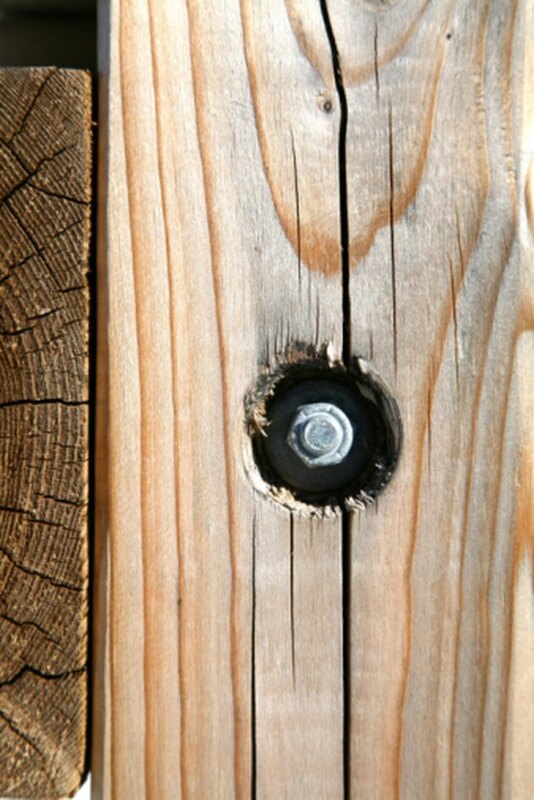 Remove the carriage bolt from the hole by pulling on its head with your hand. If the bolt won't budge after pulling on it, insert a long, slender center punch into the hole at the threaded end of the bolt and strike the punch with the hammer. Continue striking the punch until the bolt pops out.